Keep animals away from your pond or garden with a harmless blast of water. Protect your yard, fruit trees, vegetables, flowers and water features from hungry or destructive animal intruders. 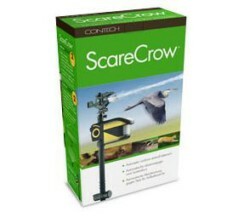 The ScareCrow motion-activated sprinkler automatically detects deer, raccoons, heron, dogs and more as they approach, and repels them with a short but startling burst of water. The sudden noise, movement and spray scares animals away, teaching them to avoid the area in future. one scarecrow covers approximately 1200 sq. ft.